Stewart’s proposed legislation is a blatant ploy for the state of Utah to gain control over lands that have scientific and scenic value and should remain within Grand Staircase-Escalante National Monument. Ten years ago my wife and I searched across southern Utah for property to live on part-time after we retired. We have traveled in Utah since 1972 — during vacations and for my fieldwork as a geologist with the U.S. Geological Survey. We fell in love with 40 acres east of Escalante, within walking distance of Hole in the Rock Road, and we purchased the property in 2008. We loved the remoteness of the property and that it bordered Grand Staircase National Monument. President Trump’s recent proclamation — if upheld in court — will remove the land adjacent to ours from the monument. We are intimately familiar with the scenic and scientific highlights of these national monument lands that Trump would exclude: the Cedar Wash Arch would no longer be within the national monument, and the trailheads and the first half of the hikes to Tunnel, Zebra and Big Horn slot canyons also would be excluded. These features are all well-publicized geologic features that attract visitors from around the country, but we have spent months exploring the public lands near our property and have discovered other wonders that aren’t as well known. The lands proposed for removal from the monument contain swarms of vertical sandstone columns of rock that formed when earthquakes or impacts of giant meteors caused layers of sandy sediment to shake violently 150 million years ago. The shaking caused the sandy deposits to became fluidized and flow as slurries upward into the overlying layers of sediment. Subsequent erosion has led to exposure of these vertical sediment pipes as columns of sandstone. Recently, colleagues and I published a scientific paper comparing these structures from near Hole in the Rock Road with similar features that the rover Curiosity has observed on Mars. Trump’s proclamation argues that these lands should be removed from the national monument because they don’t contain features of sufficient scenic, historical or scientific interest, but these geologic features contradict that false claim. Trump’s proclamation and Rep. Chris Stewart’s proposed national monument also offer contradictory stories about the historical significance of Hole in the Rock Trail. 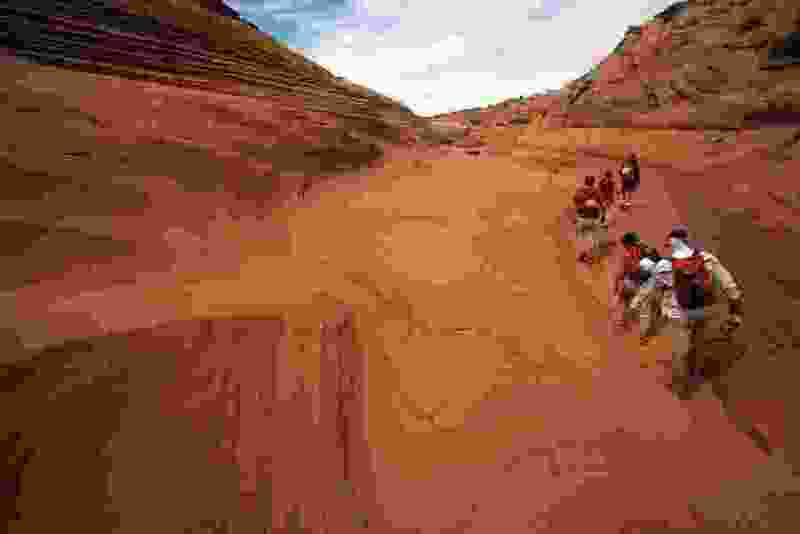 Trump’s proclamation argues that the route isn’t special enough to be retained in the monument, but his proclamation is contradicted by Stewart’s web site stating that his proposed Grand Staircase Escalante Enhancement Act “Transfers ‘Hole in the Rock Road’ to the state of Utah in recognition of this historically significant Mormon pioneer trail.” Such historical significance, if true, supports Clinton’s decision to include this Trail within the National Monument. Stewart’s proposed legislation is a blatant ploy for the state of Utah to gain control over lands that have scientific and scenic value and should remain within Grand Staircase-Escalante National Monument. Transferring these precious lands to a local “Management Council” degrades the term “national park”. David Rubin is a geologist who worked for the U.S. Geological Survey from 1975-2013 and has since worked as a geological researcher at the University of California at Santa Cruz.